PLEASE NOTE THE FOLLOWING BEFORE READING THE REST OF THE AD: - FOR SALE IS THE LP COVER ONLY WITH ITS INSERTS THAT COUNTS MOST (no record). THIS IS THE RAREST AND MOST EXPENSIVE ELVIS PRESLEY ALBUM IN EXISTENCE identifed in the 1995 Jerry Osborne "Official price guide to records", as follows: ELVIS PRESLEY "ELVIS' CHRISTMAS ALBUM" 1957, RCA Victor LOC 1035. PRICE RANGE IS BASED ON OFFERS-NOT A SALE. Album was a PRE-PRODUCTION series with just a small number of copies known to still exist. The only copy I've ever seen myself of this special, unique Elvis Presley album, the absolute pre-first pressing of the 1957 "Elvis' Christmas Album" (Elvis 4th album commercially released October 1957). DETAILS AS FOLLOWS : - width 12-3/4", height 12-1/2" - red cloth bound spine - book design hosting a 10-page booklet affixed between the two inner covers - the booklet contains 8 ELVIS COLOR PHOTOS plus one page with 3 black & white photos taken from Elvis' "Jailhouse rock" film CONDITION : - front cover is Exc. Overall (having some very minor wear on upper and bottom edges; no ring wear, no shelf wear) - back cover is Exc. Overall (having some minor imperfections here and there, nothing disturbing; no ring wear, no shelf wear) - the spine has a couple of split seams plus it was entirely reinforced with invisible tape - the spine has three pieces of invisible tape applied by factory across spine, front and back (first and second photos). The copies not having these tapes across the spine are NOT THE ABSOLUTE FIRST PRESSING of the 1957 Elvis Christmas album - the inserts and photos are NM (third and fourth photo) - there are some discoloration spots on the first page of the booklet (where the track listing is printed, also the year of release 1957 at bottom) Overall I would grade the cover as EXCELLENT. 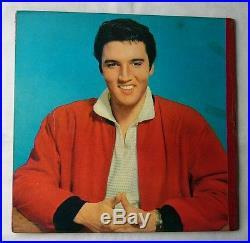 THIS IS THE RAREST AND MOST EXPENSIVE ELVIS PRESLEY LP AND POSSIBLY THE HIGHEST COLLECTIBLE ELVIS ALBUM IN EXISTENCE. EXTREMELY RARE ALBUM OF HISTORIC IMPORTANCE SAME AS BEATLES' FIRST STATE BUTCHER COVER AND TOP-PRIZED ITEM IN ANY RECORD LIBRARY IN THE WORLD. ALMOST IMPOSSIBLE TO FIND AGAIN! A MUST-HAVE ALBUM BY ALL DEDICATED ELVIS PRESLEY COLLECTORS AND FANS. Please do not confuse this album with the first and second pressings of the regular 1957 "Elvis' Christmas Album", STOCK COPIES, same catalog no. LOC 1035 so that to have a complete set. Ships in sturdy record LP mailer box. 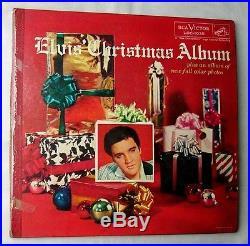 The item "ELVIS PRESLEYMEGA RARE 1957 CHRISTMAS COVER LPWIDE SIZERCA LOC 1035" is in sale since Sunday, April 16, 2017. This item is in the category "Music\Records". The seller is "hopeaudio" and is located in Hartford, Connecticut. This item can be shipped worldwide.